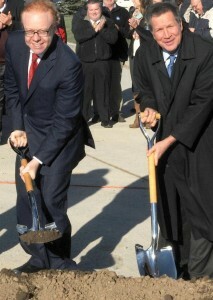 Anthony Pratt joined by Governor John Kasich at groundbreaking ceremony for new plant in Lewisburg, OH. Pratt Industries has broken ground on a new $US44 million box factory in Ohio, which owner-chairman Anthony Pratt says will be an environmental showpiece for the corrugated industry. “We believe this facility will be the future of our industry,” said Pratt, noting it would not only convert 100% recycled paper but also use advanced water reclamation technology. Anthony was joined at the event in Lewisburg by Ohio Governor John Kasich. The ceremony comes just weeks after the company announced a 4th, 100 percent recycled paper mill would be built in the neighboring state of Indiana. The 350,000 sq. ft. plant, which will be built adjacent to the company’s existing box-making facility in Lewisburg, is expected to come on line in June, 2014. The new factory will be Pratt’s 4th facility in Ohio, and together they represent an investment of more than $US100 million. The company already employs more than 400 people in Ohio, and that total will climb to almost 550 when the new plant reaches capacity. “And we’ve done this by largely green-fielding paper mills and box plants like this one…so we are creating new jobs, not just shuffling them from one plant to the next,” said Pratt. Pratt Industries has grown from the 46th largest box producer in the U.S. to the 5th largest with more than 70 facilities across the country and remains the only major corrugated producer in America to use only 100% recycled paper. Work on the US$260 million paper mill project will begin in March, 2014, and is expected to take 16 months. It will be sited on a 50-acre site about 50 miles south of Chicago, adjacent to Pratt’s box-making plant in Valparaiso, Indiana. Check out this great video coverage of the event from the local ABC news affiliate!